Vice President Mike Pence swore in two new US Senators today - the first of which is Democrat Doug Jones, who defeated Republican Roy Moore to win the December 12th Alabama Special Election to replace now-Attorney General Jeff Sessions. 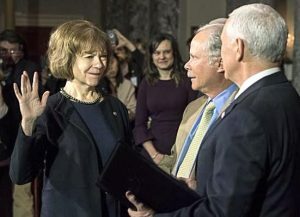 The second - Democrat Tina Smith, will serve as Minnesota's interim Senator until a November, 2018 special election is held to formally replace Al Franken, who officially resigned Tuesday. The two new Senators narrow the GOP's majority in the United States Senate to a slim lead of 51 Republicans and 49 Democrats in the United States Senate. A total of 34 of the 100 US Senate seats will be up for election this November, with the Democratic Party defending 26 seats (including two Independents), and Republicans seeking a hold on their current seven. This means Democrats will need to pick up a net gain of two seats to take the majority in 2018. While three of the GOP seats are open following the declared retirements of Jeff Flake (R-AZ), Bob Corker (R-TN) and now Orrin Hatch (R-UT), all the Democratic seats are held by incumbents running for re-election, with the exception of Minnesota. Republicans may also be facing two additional special elections in 2018 if Senators John McCain (R-AZ), who is not up until 2022, and Thad Cochran (R-MS), up in 2020, are forced to retire early for health reasons. By most assessments, as of today, control of the US Senate will come down to key contests in Indiana, Missouri, Nevada, North Dakota, West Virginia and Wyoming. In additional to the US Senate races, all 435 Members of the US House of Representatives are up in 2018, and they are exiting in record numbers. 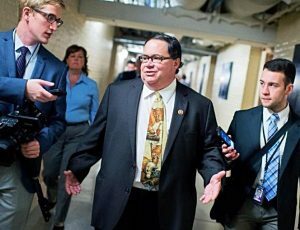 With just two-year terms, House incumbents are much more vulnerable to the political environment and, between the Trump backlash and the growing number of sexual harrassment allegations, an unprecedented 39 Members have announced their resignations, retirements or plans to vacate office to run for another office. Of those, 25 are Republicans and 14 Democrats, bringing chances of a Democratic takeover closer, but still far from the net gain of 24 seats needed to take the majority.